To compete at any level above the shortest distances requires the services of a crew. A crew is one or more support people who will assist in all aspects of the competitive ride. They will help get you to the start line on time and will then travel to Crew points and vet gates where they will support both horse and rider. At the end they will assist in getting the horse ready for the final vet check and in ensuring all the horse's needs are met after the ride. 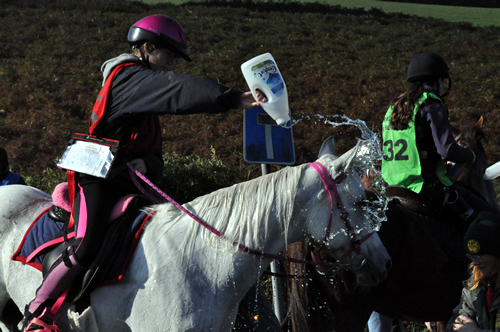 One of the main roles of a crew is to support the rider and horse during the ride. This is generally at pre-defined crew points, check points and at vet gates for the longer distances. Crewing involves supplying water to cool the horse, liquid for re hydration of both horse and rider as well as providing energy foods as necessary. When the going is tough due to the ground conditions or adverse weather, moral and psychological support is also needed again for both horse and rider. Conditions can be rough on the high moors when the wind is howling, rain blowing into your face and no one for company. But that said many riders will ride in small groups, at least for the initial stages of ERs and often for the whole route in CTRs so company is often available. On beautiful days the rides can be inspiring but this can mean using lots of water to keep horse and rider cool. It is the crew's job to ensure sufficient water and other items are where they are needed when they are needed. In longer distance rides the crew will often do most of the work to cool your horse down and reduce the heart rate before a vet check while the rider takes a well earned rest. Being a crew is a bit like being in the pits at a F1 race - lots of preparation, waiting around , drinking coffee, great craic and then suddenly all go when the rider arrives. Then move quickly to the next point and start all over again. You can meet new people and forge great friendships through crewing at Endurance Riding events.